The Eierlegendewollmilchsau is a most unique creature. In addition to having a very long German name, it is capable of providing an amazing amount of bounty for one animal. It can lay eggs, grow wool, provide milk, and even bacon – all from one animal. Literally translated, Eierlegendewollmilchsau means “Egg Laying Wool Milk Sow”. But there is a catch. Sadly, the Eierlegendewollmilchsau doesn’t really exist. It is a mythical creature that has come to symbolize the concept of “all-in-one” and is mythical because nothing exists that can combine so many useful and beneficial features in one place. There is, however, a city in northwestern Germany that has come close. 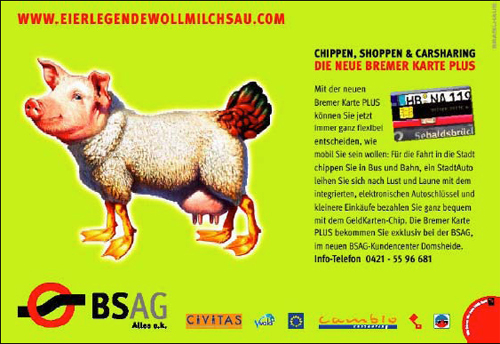 Bremen, Germany has succeeded in creating a completely integrated transportation network that is entirely accessible with a single card called – you guessed it – the Eierlegendewollmilchsau. A passenger can easily ride their bike on one of Bremen’s well maintained bike lanes, catch a light rail train, take a bus across town, rent a car from a convenient car-sharing kiosk, and even do some banking at an ATM, all with this one card. It’s a great example of planning a system that puts a priority on user convenience and treats many different types of transportation as seamless, purposefully linked and overlapping. By keeping the ease of use of the passenger in mind more people are more inclined to use it, ultimately making for a healthier environment and higher quality of life. – and the video below.